I know you guys like seeing these things. This one is not mine (was not the buyer nor seller) but recently traded hands. Ooh, nice - thanks for sharing! Great to see an in-progress version of this iconic piece - one of my favourite pieces of western Sonic cover-art. Tails with skin-coloured fur is something I've not seen since those old... what were they, Burger King or McDonald's toys? Wonder if there's a connection, haha - can't remember which year those were produced. Buyatari, how does one become informed when this sort of thing goes up for sale? And how/why are you in possession of so much of this artwork? Not the Sonic christmas crackers figurines? Tails had flesh-coloured fur in the prototype shot of those. I'll start off by saying again that I was not the buyer or the seller. This particular piece was never mine. The video game art that I do have comes from getting a head start on most other buyers. As for how to keep an eye on the video game art marketplace, I would recommend this group on facebook. Closed group so you have to be a member to see posts. Not just the prototypes, the final figures had that colouring too. As with Greg Martin's image, tan coloured tummy/muzzle/ears, but white tail tips. Oh, right. They were more extreme in the protos, though. It's unlikely this particular manga did much influencing - you'd expect Sega of America to be leading the way for Sonic 2 and 3. In fact, Tails looks as if he's been nabbed from some Warner Bros. cartoon (the cheapo ones from the 1960s) - like they only had a vague description of the character to work with. This Greg Martin painting is probably the first to use the wrong colours, and I would imagine licensors copied it from there. 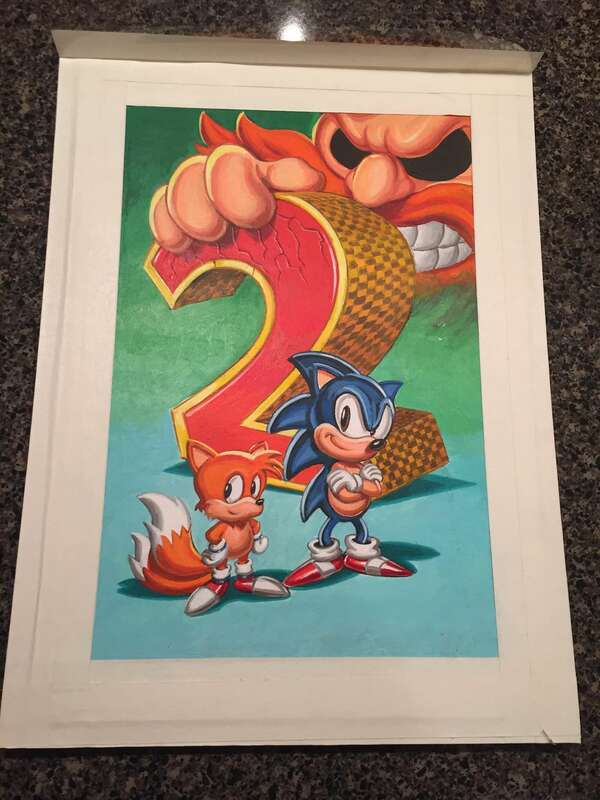 It would still be a strange coïncidence that this manga has a Tails with a color scheme that was used later by the US merchandising... and let's not forget the brown Tails from the nineties cartoons. Can't be just a coincidence... It's very likely that Tails' prototype design did have that color scheme and then that merchandise and artwork was made from SEGA's rushed orders. Thanks for sharing it, Buyatari! Yeah, it's not unusual for promotional photos to have prototypes. 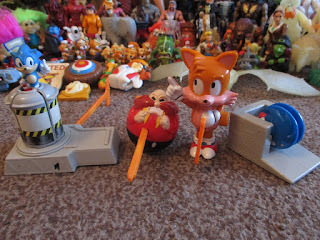 The Sonic and Robotnik figures’ eyes are a bit off too.